Click here for the 2016 HockomockSports.com Boys Soccer Awards. Below are the official 2016 Hockomock League Boys Soccer All Stars, selected by the coaches in the league. MANSFIELD, Mass. – For Attleboro, the third time playing Hockomock rival Mansfield proved to be the charm. The Bombardiers suffered a 3-0 loss to the Hornets early in the season and settled for a 1-1 draw in mid October. But on Saturday night, Big Blue picked up the win in the game that mattered most, walking away from Alumni Field with a 1-0 win in double overtime in the MIAA D1 South First Round. Eighty minutes of regulation and 10 minutes of the first overtime period wasn’t enough to separate the two but it took less than a minute of the second overtime period for Attleboro to find the winner. 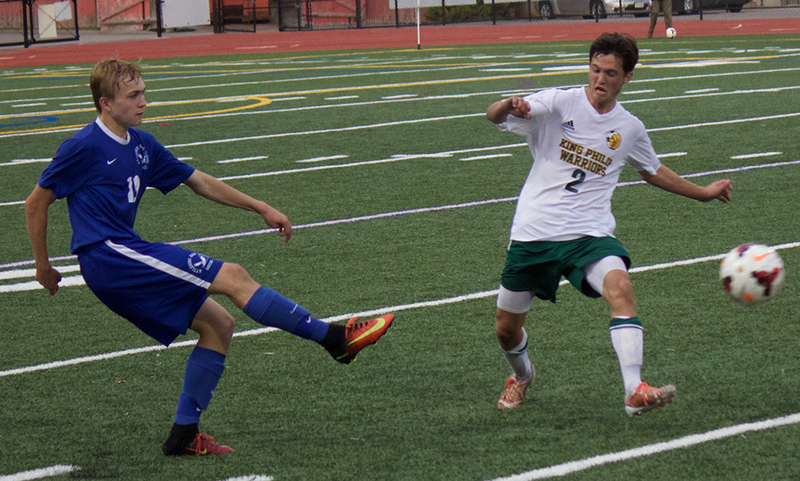 Sophomore Colin Levis blocked a clearance on the right wing, raced to the ball and delivered a cross into the area. Mansfield goalie Nick Ferraz dove out, getting a hand to the service. The ball fell to sophomore Will Halben, who calmly cut the ball back and used his toe poke with his left foot to find the back of the net for the winner. It’s the third time in the last four games that Halben has scored the game-winning goal in a 1-0 win for Attleboro. “He’s got the speed around the net, he’s been pretty good,” Attleboro head coach Peter Pereira said. “He missed his first one and just pushed it in with his toe. It was a good game, Mansfield kind of carries the play a little bit. Those throw ins are deadly. We’ve been practicing defending them but they are so hard to defend because of Mansfield’s height. Even though they had most of the possession, we needed a break and that’s what we got. The boys played well. The Hornets had over a dozen attacking throw ins and nearly 10 free kick opportunities that put the ball into the area but the results included either hitting the post, a save from Bombardier goalie Nick Hasenfus, a shot wide or a clearance from Attleboro’s defense. The effort off the post came early in the game when Cullin Anastasia rose up to meet a throw from Max Gurnon. His header bounced once before hitting the post and staying out. Rebound chances from Brendan Sullivan and Anastasia were blocked by defenders. Ten minutes later, a service into the area eventually bounced out to the top of the 18, but Sullivan had his shot on target saved by Hasenfus. Mansfield had the two first chances of the second half as well when Max Gurnon ripped a shot from the left wing that went to the far post but Sean Lanzillo’s touch went just over the bar. Five minutes later, James Chotkowski’s header off a corner from Kevin Bouck bounced wide at the far post. Attleboro finally had a chance in the 61st minute with Halben blocking a clearance, racing around a defender and going in at goal at a tight angle but Ferraz did well to come out and cut the angle down, holding onto the ball after sliding out. 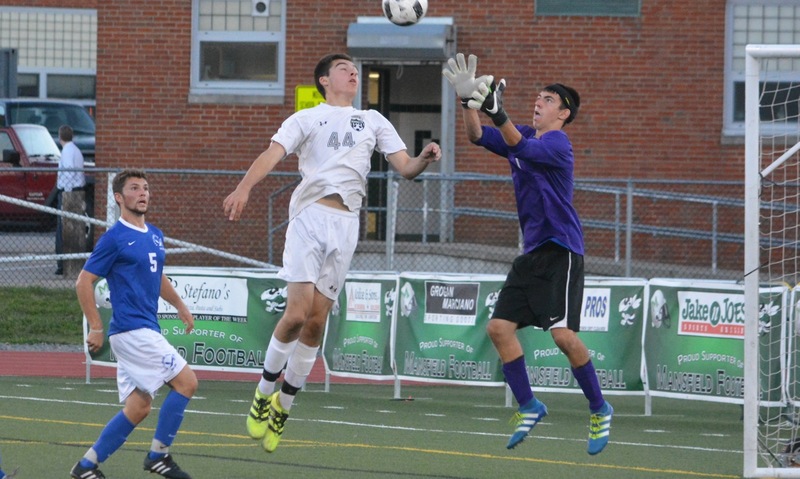 Two minutes later, AHS freshman Mike Russo lofted a cross into the area but Halben’s header went wide of the far post. Anastasia got his head to a throw from Gurnon in the 72nd minute but Attleboro defender Tyler Treichler was positioned well and headed the ball clear before it could get through to Hasenfus. Hasenfus made the biggest stop of the game in the 78th minute. Gurnon dropped a free kick into the area that fell between Sullivan and Anastasia. Anastasia was the one to pounce, unleashing a shot from inside the 6 yard box but Hasenfus was positioned perfectly and knocked the bid aside. Attleboro boys soccer (8-5-6) will take on #4 Braintree in the D1 South Quarterfinal. The Bombardiers will visit the Wamps on Monday at 6:00. Mansfield finishes the season 11-5-3. ATTLEBORO, Mass. – The Attleboro attack has been far from potent this fall, scoring only 13 goals through the opening 16 games of the season and more than one goal in a game just twice, but on Wednesday night at Tozier-Cassidy Field a young Bombardiers team still had the opportunity to book its place in the state tournament. Not surprisingly, Attleboro would only get one goal, but it turned out to be all it needed against Taunton. Sophomore Will Halben scored the winner for the second straight game, as the Bombardiers held off the Tigers 1-0 to qualify for the postseason. For two teams that had combined for only 22 goals coming into the game, Taunton and Attleboro started wide open with chances coming thick and fast in the opening half hour. Ahijah Joseph got the attack going just two minutes in when he ran onto a through ball from Nick Lawrence, but his shot sliced wide of the post and into the side-netting. Two minutes later, Taunton had its first chance with Sean Crowley getting space in the right channel but sending a shot over the bar. Joseph had a header on a corner cleared off the line by Taunton defender Jake DeAndrade and on the other end Crowley got hold of a volley but hit is straight at Attleboro keeper Nicholas Hasenfus. Taunton keeper Tim Gambaradella was then called into action for his first save when Zach White’s pass bounced into the path of Michael Russo but the goalie smothered the shot. The game’s lone goal came in the 23rd minute. Devin Andre slid a pass behind the Taunton defense for Halben to run onto and the sophomore showed poise to calmly slide the ball inside the far post and past Gambaradella (four saves). Taunton almost answered back immediately, but another shot found the side-netting. The Bombardiers could have doubled the advantage in the 28th minute when Russo found Nathan Laplume for a scoring chance only to be denied by Gambaradella at full stretch. The rebound fell kindly to Halben but he smashed his shot off the crossbar of the goalposts just above the net. The next chance for either team would not come until nine minutes after the break when Lawrence had a shot saved and then his follow up was blocked out for a corner by Dan DeAndrade. That would be the last clear-cut chance for either team until the final three minutes of the game. As end-to-end as the first half of the game was, the second turned into a midfield stalemate with both teams clogging up the middle of the pitch and limiting the opposition’s ability to get the ball into the final third. First-year Taunton coach Taylor Whitters credited the Tigers defense for closing the gaps and taking away space in the second half. Joseph nearly set up Lawrence in the closing minutes but the cross just missed the forward at the back post. With the clock stopped in the final two minutes, Russo had a chance blocked on the slide by Liam Crowley and then Lawrence flicked a pass to Russo who pushed it on to Austin Champagne, but Gambaradella came through with a stellar dive down to his left to deny the second goal. Attleboro (7-5-5, 7-4-5) will close out the regular season on Saturday afternoon in the annual Leach and Garner Cup against North Attleboro. NORTH EASTON, Mass. – Each year, Oliver Ames head John Barata says goal number one for his squad is to make the tournament. The Tigers can check that off the list for 2016. Oliver Ames scored a pair of second half goals and senior Ben Kemp made a couple of big saves as the Tigers landed a 2-0 win over Attleboro. The win gives Oliver Ames 17 points on the season, qualifying them for the D2 MIAA South Tournament. The win was also Barata’s 100th career win. In a relatively even first half, both OA and the visiting Bombardiers had decent scoring chances. A corner kick in the 11th minute fell to the feet of OA senior Joe LaBrosse but his low chance was blocked by a defender at the post. 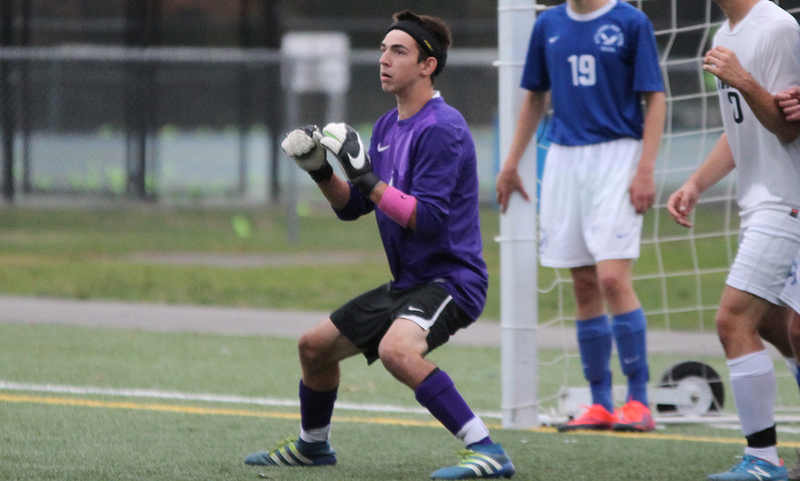 In the 18th minute, Attleboro senior Tyler Treichler denied OA of two solid scoring chances. First, it looked as though OA sophomore Nathaniel Cardoza would have an open look from the left side of the area but a slide tackle from Treichler denied the bid. Less than a minute later, LaBrosse had a chance from inside the area but once again Treichler got his leg in the way. In the 23rd minute, OA’s Matt Campbell played a ball over the top for Thomas McCormick, who tried to chip the keeper but Attleboro’s Nick Hasenfus got a paw to it and pushed it wide. Attleboro registered it’s first real chance in the 29th minute as Nick Lawrence was given some space for a shot from just outside the area but Kemp got a piece of it and smothered the rebound. A minute later, McCormick had a go from just outside the area but OA but Hasenfus was quick to get down and handle it. Oliver Ames was content to sit back for the majority of the half, and did so to start the second half. The team’s patience paid off less than 10 minutes into the second half, as Oliver Ames saw an opportune time to press. Cardoza chested down a clearance and took a touch towards the final third. He was able to push the ball past a defender towards the touchline, forcing Hasenfus to come out. Cardoza slipped the ball back to the middle where McCormick was able to tap it in to make it 1-0. “I think the challenge is they don’t expect it from OA, because we’ve always pressed high and kind of run and gun and get forward, possess a little bit and then get forward again. By us sitting back, opponents have to make adjustments,” Barata said. “We like it because control the tempo, we can go slow, we can go fast, we can go in between. The best part about is, teams just give it to us sometimes because they try to go over the top or through the middle and then our guys are good when we have the ball. It can be frustrating to try and beat. So far, we’ve been successful doing it. Attleboro sophomore Will Halben had a chance to level the game a minute later, taking a shot from the left side of the area. Kemp got a piece of it and Chris Lawrence cleared the loose ball. The Bombardiers had their best chance in the 57th minute. Zach White’s free kick spilled to the right side of the area where senior Harry Lancaster was able to track it down. He launched a service back in front of goal where freshman Michael Russo put a header right on frame but Kemp came flying back into position to stop it. Oliver Ames doubled the lead just four minutes later in the 61st minute. Lawrence launched a throw in in the attacking third that found Cardoza in the area. The junior flicked the ball on, right to the head of classmate Cam Vella for an easy header into the net. Attleboro drops to 5-5-5 overall, with 15 points. The Bombardiers need to get 18 points to qualify for the postseason and have three games left to get those three points. Oliver Ames boys soccer (7-4-3) is headed back to the postseason after going to the D2 State Final the last two years – winning it all a year ago. The Tigers’ seventh win of the season was also Barata’s – and assistant coach Fred Kurtz’s – 100th career win. WRENTHAM, Mass. – After tying Attleboro earlier in the season, King Philip knew it would need more than the one goal scored in the first half. The Warriors were able to turn it on in the second half, adding three more goals, to blank the Bombardiers, 4-0. The Bombardiers came out strong and held the ball for most of the time in the first 20 minutes. 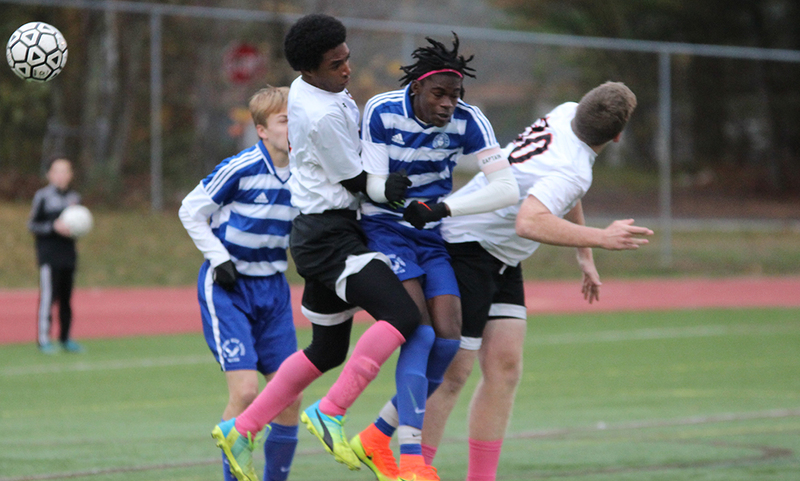 Multiple chances opened early for Attleboro, but none ended in the back of the net. Most notably, in the 2nd minute, Ahijah Joseph streaked right up the middle of the Warrior defense and was just barely stopped at the last row of defense by a sliding Cameron Mullins. Attleboro kept the pressure on, but the game slowly began to shift towards the other end, putting KP on the offensive. Once they got the ball rolling, KP never looked back. KP’s first real chance came in the 12th minute when the ball was advanced into the zone and a waiting Colby Koch was ready to receive it. The Bombardiers defense came crashing in on Koch, a little too hard, and ran right into him, drawing the penalty kick. Mullins then lined up to take the ensuing penalty kick and booted it right past a diving Nicholas Hasenfus to open the scoring. With a lone point up on the board for KP, the rest of the first half washed away with no real threats by either side. To try to find a spark, Attleboro’s head coach Peter Pereira made a lineup change in the second half. He moved Harry Lancaster, who was previously leading the defense, to the front of the formation. This proved to be a smart decision as Lancaster helped the offensive attack for the Bombardiers. After multiple shot attempts to open the half, the Warriors finally capitalized in the 47th minute. Tyler Mann dribbled the ball right up the gut of Attleboro’s defense and put a beautiful touch pass past the last defender right Koch. Koch then sidestepped the charging Attleboro goalie and was left we an easy tap in to double to score. The Mann-Koch duo struck again just eight minutes later, but this time the roles were reversed. Koch, who had the ball on the wing, found Mann on a low cross, and the junior tapped it in at the far post to make it 3-0. After the two quick goals, Attleboro tried to stop the bleeding with a time out. After the timeout, Lancaster helped put together one of Attleboro’s better looks of the game. He weaved in and out of the Warrior’s defense until he had an open shot on net but KP keeper Eli O’Neill came up with a big save. O’Neill cleared the ball out by tossing it to Mullins, who then booted it down the field. He toed it right over the entire Attleboro defense to find Koch on the opposite end of the field. Koch took advantage and tapped in another wide open net for his second goal of the game. With the Warriors up by four, it was a game of keep away for the last 20 minutes. KP kept up their pressure but did not get any more solid looks at the net. Attleboro did see a few more chances before the last few seconds ticked off the clock, however. The Bombardiers had two consecutive free kicks in the final three minutes of the game, but both were stopped in their tracks by KP’s defense. “I think we moved the ball well. We created a lot of scoring opportunities; I thought that was awesome,” King Philip head coach Nick Gale said. With the win the Warriors improve their record to 13-0-2 and keep a zero in the win column. The King Philip Warriors will try to stay hot as they face a true test in Oliver Ames on Wednesday. Attleboro will look to bounce back as they play host to a very talented Mansfield team on Wednesday as well. FOXBORO, Mass. – As teams enter the final weeks of the regular season and points are at a premium, Foxboro and Attleboro settled for one apiece as they fought to a 0-0 draw at Sam Berns Community Field. Despite dominating the majority of the first half, and recording more scoring chances in the second half, Foxboro was unable to find the back of the net, hitting the crossbar once and being stopped by Attleboro goalie Nick Hasenfus on other attempts. Meanwhile, the Bombardiers continued to be frustrated by the Warriors’ high pressure and their lone serious chance of the second half was blocked away before Bobby Harrison was forced into a save. 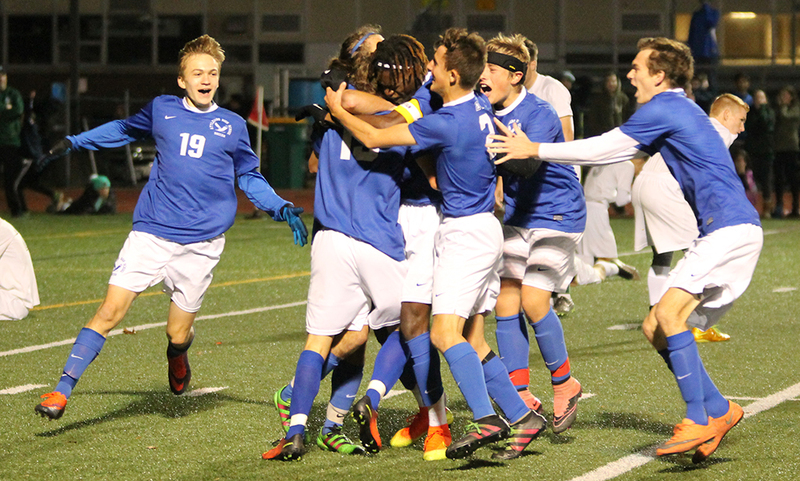 After Attleboro registered the first scoring game in the 13th minute – a sequence between Aidan Lancaster and Ahijah Joseph resulting in a shot over the bar from Nick Lawrence – it was essentially all Foxboro for the final half hour of the opening stanza. In the 17th minute, Anthony Barreira played Colin Spinney wide and his low cross was met by a one time shot from Nic Beigel but his shot skipped wide. In the 25th minute, Beigel sent in a low service to the near post where freshman Joe Cusack got a touch to it but Hasenfus cut the angle down and got just enough to keep it out. Three minutes later, after a corner was partially cleared, a service from Will Regan eventually was deflected to Barreira, who volleyed a rocket right off the crossbar and out. The Warriors had two chances in the final minute with Spinney finding Cusack at the near post but his shot was wide and then Cusack returned the favor by playing Spinney in but Hasenfus denied his shot to send the teams into the halftime break scoreless. “We’ll take any tie because our goal is to get points,” Attleboro head coach Peter Pereira said. “We need points, we have four left so any point is great. Obviously [Foxboro] played better than we did, we got lucky because they hit the bar and they had a few opportunities. But we’re going home with a point so that’s excellent. It was one of our weakest games. We just had our best game last game and it was 0-0 then too. We dominated that game but here today, no. Foxboro was hungry, they were winning the 50/50 balls and had opportunities. The first half was all them. I don’t usually call timeouts but Foxboro was just putting pressure on us. The Bombardiers registered the first chance of the second half when Austin Champagne pounced on a loose ball off a corner kick but his bid was blocked. Foxboro’s AJ Bubencik had a shot from just outside the area saved by Hasenfus in the 57th minute and Barreira had a similar shot smothered by Hasenfus in the 61st minute. The Warriors continued its pressure and it resulted in another good bid. Barreira played Spinney wide but his shot just rolled wide at the far post in the 67th minute. 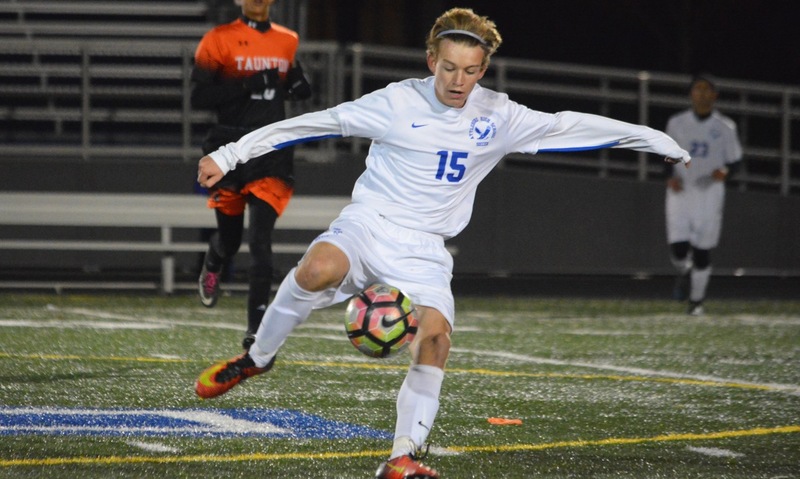 Attleboro had its best chance in the 70th minute when Joseph sprang Will Halbem in behind the defense but before he could uncork a shot in the area, Foxboro’s Shawn McNamara slid in and pushed the ball out for a corner kick. Foxboro boys soccer (2-7-3, 1-7-3), which has earned at least a point in four of its last five games, will look to continue that trend when they travel to Sharon on Monday. Attleboro (5-3-4, 5-2-4) travels to Wrentham to take on Kelley-Rex leading King Philip the same day. MANSFIELD, Mass. – Coming into Thursday night’s game at Alumni Field, Attleboro coach Peter Pereira warned his defense about the long throws of Mansfield senior defender Max Gurnon. He warned his defense that it is a major weapon for the Hornets and that they need to be prepared anytime Mansfield wins a throw anywhere near the attacking third of the field. No matter how many warnings Pereira gave, it does not make it any easier for the defense to deal with Gurnon’s bombardment of throws. He assisted on the first goal and got credit for the third when it was headed home by an Attleboro defender. Gurnon created consistent havoc in the Attleboro penalty area and the Hornets took advantage to pull out a 3-0 victory. Mansfield coach Steve Sheridan said, “We’re starting to cash in on his throw-ins, a lot better than we used to. We’re working on them. I’d like to see more goals from the flow of the game, but we’ll take them. The Hornets nearly had the perfect start when Sean Lanzillo chipped a pass over the top for Kevin Bouck in the first minute but the senior could not finish the chance, sending his shot over the bar. Attleboro had a quick response four minutes later when a corner was not properly cleared and Will Halben hit a near-perfect half-volley that smacked off the bar. The rest of the first half was dominated by the Hornets with the ball constantly in the Attleboro half and Gurnon getting chance after chance to put a ball into the box from free kicks and throws. In the ninth minute, one of his throws paid dividends when it eluded everyone in the middle of the box, bounced on the far side, and was nodded into goal by Jackson Murphy at the far post. At the midway point of the half, Mansfield doubled its lead. James Chotkowski lined up a shot from 20 yards out and forced Attleboro keeper Nicholas Hasenfus into a full stretch save. The resulting corner bounced off Brendan Sullivan to Sam Hyland on the edge of the box and he fired in his chance to make it 2-0. The Hornets were relying on Gurnon and Harry Braidt to hold down the center of the defense and limit the chances for Attleboro. The Bombardiers started pressing forward at the end of the first half and during the break Pereira urged his team to continue pressing the Hornets. Just before halftime Colin Levis sent in a dangerous cross from the right but it went just over Halben inside the six and just missed the toe of Ahijah Joseph sliding in at the back post. The Bombardiers continued the push forward in the second half with Zach White becoming more influential in the midfield. Mansfield had the opportunity to put the game away in the 55th minute when John Cooney escaped a challenge by Harry Lancaster and raced in clean on goal. Hasenfus (four saves) denied him with a slide and Hyland had his follow up cleared off the line. A minute later the Bombardiers nearly cut the lead in half when freshman Nathan Laplumeflicked a pass into classmate Michael Russo, but, while the Mansfield defenders screamed for an offsides that was not forthcoming, Russo rolled his shot inches wide of the post. Chotkowski nearly killed the game off with a header off a throw in the 64th minute and Cullin Anastasia also sent a header wide three minutes later. The Hornets finally put the game away with yet another throw by Gurnon. This one was headed into goal by an Attleboro defender with 12 minutes to play. It was the fifth straight win for Mansfield (5-0-1), which stays unbeaten ahead of Monday night’s visit of Franklin. Attleboro (2-2-1) drops back to .500 with the loss and now faces a tough stretch beginning with Saturday’s visit of New Bedford followed by Franklin and Oliver Ames.